She’s good at creating spaces for people to share ideas, chart new routes, and mark milestones. She is also equally adept at orchestrating events in multicultural settings. Digna Manzanilla takes the baton from former CURE coordinator David Johnson and leads the second phase of IFAD funding support for the Consortium (2014-17). Before taking on this huge responsibility, Digna served as CURE associate coordinator from 2010 to 2013. During these 3 years, she brought in her expertise as a social scientist by taking the lead in monitoring and evaluating the impact of stress-tolerant varieties on the lives of farmers. 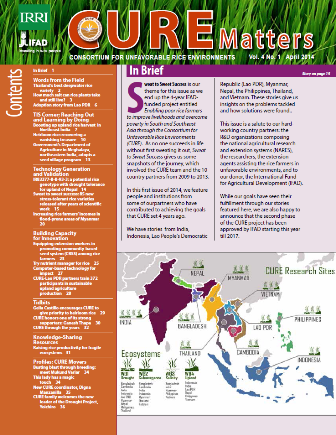 Digna’s research aims to find out farmers’ preferences, the reasons for preferring to adopt certain varieties and not others, the basis for non-adoption, and gender-related issues that arise when men and women also try the new improved rice technologies. Moreover, at CURE, she champions the strengthening of the informal seed sector through the CBSS. She is passionate about linking communities interested in CBSS with other groups who are in the best position to assist, training them, and capturing lessons learned to help others carry on the same advocacy. 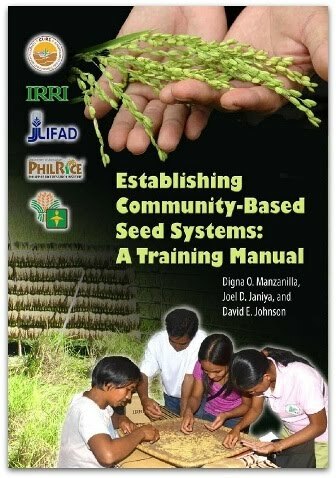 Two of the more important manuals produced are the Community-based Seed System Manual, which was recently adapted and translated by Indonesian CURE partners and the Participatory Varietal Selection Manual. Digna, currently an IRRI Scientist (social sciences), dreams of making CURE a knowledge bank, a one stop-shop that would contain and unite all data and knowledge resources for rice research in unfavourable environments. She holds a PhD in Environmental Science and Management, minor in Social Theory, Environment, and Development Communication, University of the Philippines Los Baños, Philippines and a Masters degree in Agricultural and Resource Economics from the University of Hawaii.